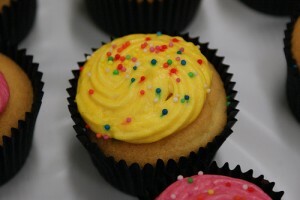 Cupcakes have been mounting in popularity all over the globe, and we are contributing our fair share in Adelaide. There is a mass of specialist cupcake shops, and cupcakes are cake substitutes wherever possible, even at weddings. And now we have had Cupcake Camp, too. No, it’s not all about eating as much cake as possible in a few hours. Cupcake Camp was started in San Francisco and is based on the principles of BarCamp: an ad hoc gathering of like-minded people. Many cupcake camps are entirely free (yes, that’s right—free cake! ), but others, like the inaugural Adelaide event, adopt a model where entry is free but the cakes are fundraisers for an adopted charity. 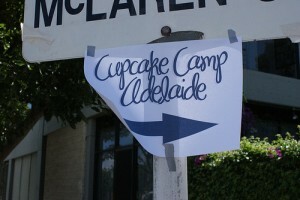 Adelaide’s Cupcake Camp, held in November at The Box Factory Community Centre and organised (almost singlehandedly) by Monnie Klein, directed proceeds to Camp Quality. It was a particularly apt choice: Camp Quality is an Australian charity which is dedicated to “bringing optimism and happiness to the lives of children and families affected by cancer through fun therapy.” And what is more fun than an afternoon of cakes? With the cupcakes lined up on one side of the room, consumers on the other, as Monnie declared the event open the rush was on. Many people had come prepared, with trays or boxes to take away a large selection of goodies. Others were happy to force themselves to eat the cakes there and then. The range of cakes on offer was impressive: Monnie’s award-winning Oreo cupcakes featured along side Jelly Slices, red velvet cakes and even hamburger-styled cupcakes. It was the dairy-free vanilla cupcakes that took first place in the ‘best cupcake’ competition. Preheat oven to 180°C (or 160°C fan forced). Using an electric mixer, beat spread, vanilla extract, sugar, flour, egg and 3/4 cup cold water on low speed for 1 minute. Increase speed to high. Beat for a further 4 minutes or until mixture has thickened. Spoon into cupcake cases placed in cupcake trays and bake for 12 to 15 minutes or until golden brown and a skewer comes out clean. Leave them in the tray for 2 minutes before turning them onto a wire rack to cool. This makes up to 30 cupcakes, depending on your combination of regular and mini. Use an electric mixer and beat the spread, icing sugar and orange essence in a bowl until light and fluffy. Add 2 to 3 drops of food colouring and beat to combine. Place icing in a piping bag, piping gun or plastic bag with one corner snipped off. Pipe icing onto cakes. Add some sprinkles and you’re done! -Alex Prichard is the publisher of Eating Adelaide. 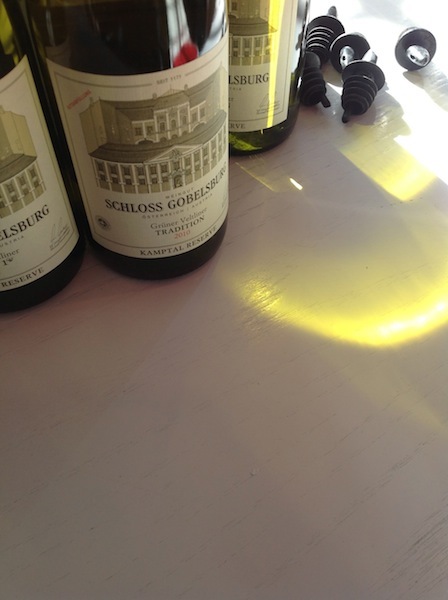 She runs a wine education business, Wine Academy. 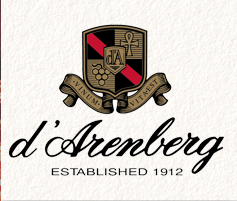 Alex passed the WSET Intermediate and Advanced certificates (both with Distinction, and in 2008 I won the WSET’s A A Calem Port Award) and completed the Professional Certificate in Gastronomy which was previously run jointly by the University of Adelaide and Le Cordon Bleu. What really qualifies her is that she eats anything and everything, anywhere and everywhere!